I started painting this doll more than a year ago and had to set her aside for other projects. When I got to work on her again, I couldn’t remember what my vision for her had been. 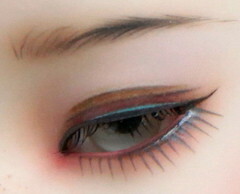 Usually, this doll sculpt is painted in gentle, soft colors and she’s very sweet and old-fashioned. I had black liner around her eyes and had laid in smokey eyelids and darkly blushed cheeks–Hmmm… I’m guessing that everyone has come back to a project and wondered “What was I thinking?” I’m still not sure what my original plan had been, but Modigli became a dramatic, freckled girl with raspberry lips. I made her a pigtail wig out of silky black Tibetan lamb. The IMDA dolls are sculpted by a Korean artist named Lim Dong a. He has been in many prestigious exhibitions, has been an art instructor, and is now a director at Soom (a successful manufacturer of art dolls). I always assumed that the sculptor of these dolls would be female since they are so sweet and feminine, but the references I’ve founds say “he.” The IMDA dolls have angelic round faces and cute pear-shaped bodies. 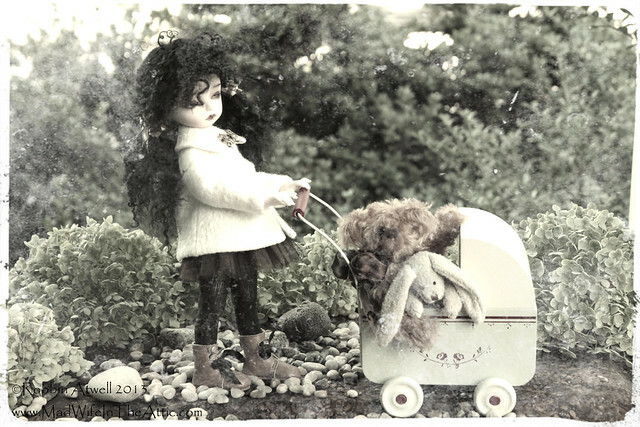 Here is a photo of the body from their website and some links if you want to learn more about the artist and the dolls. One of the things I like best about this doll artist is that he provides free sewing patterns for us crafty types!! Photo from the IMDA website showing the body detail. Click the photo to visit their site and see more IMDA dolls. Here are a few more pictures of my Modigli. Click photo to see more “Before & After” doll faces in my Flickr archive. I purchased this stroller from Ed at “Happily Ever After” toy shop in Philadelphia, Pennsylvania. He carries of full line of this furniture. 25 Sep	This entry was published on September 25, 2013 at 4:47 pm. It’s filed under BJD Faceups and tagged ABJD, Asa, Asian, Ball Jointed Doll, BJD, Doll, Faceup, IMDA, Lim Dong a, Modigli, Normal, Real, Resin, Robbin Atwell, Soom, Tibetan Lamb, Tiny, Wig, Yo. Bookmark the permalink. Follow any comments here with the RSS feed for this post. Now I have to have one like her.